A Rock Hill real estate firm is bringing co-working to the Knowledge Park area of the city. 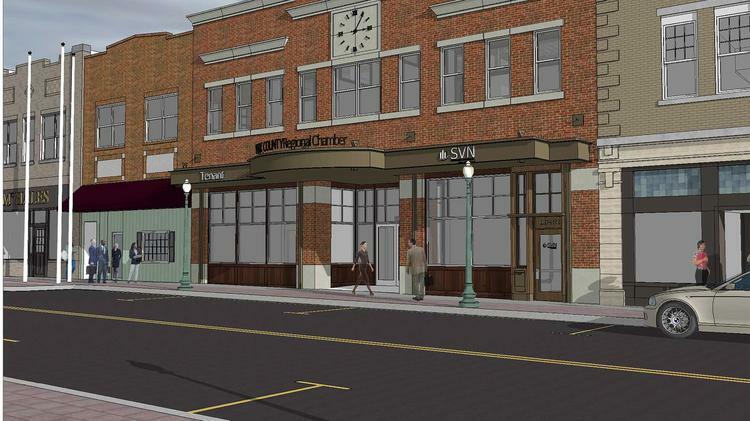 SVN/Southern Commercial Real Estate expects to open Collision Cowork on the second floor of the York County Regional Chamber of Commerce building in March. Mayfield says the company is spending about $900,000 to upfit the entire 6,400-square-foot space, which includes a new office for the real estate firm. Mayfield and Randy Graham, the other co-owner of SVN/Southern, recently bought the second floor of the building, located at 116 E. Main Street in Rock Hill. Collision Cowork will offer shared space with comfortable seating, open work areas, dedicated desks, private offices, meeting rooms, Comporium’s Zipstream Wi-Fi and Ethernet connections, free parking, printing services and a kitchen. Collision customers will also be treated to free coffee, Mayfield says. Prices range from $20 for a day pass to $699 for a private office. Rob Youngblood, president of the chamber, says co-working is becoming popular among professionals who only need a desk or a small office with amenities and services that are shared. Stephen Turner, economic and urban development director for the city of Rock Hill, says the new economy includes room for such businesses. “We see co-working spaces as another key ingredient in the formula of success in developing a vibrant, creative, working culture in our urban core,” Turner says. Charlotte has several co-working spaces including a second location for Hygge (pronounced Hooga) off Morehead Street and HQ in Packard Place, which spent $1 million in renovating the space in uptown. To learn more about Collision Cowork, visit the firm’s website here.